The Silver Max is a baitcasting reel that anglers use for species like bass and northern pike. Experienced fishermen who want to make precise casts, or use heavy equipment and fish for large species like bass and northern pike, choose baitcasting reels like the Abu Garcia Silver Max. The reel can be adjusted to suit a variety of fishing situations and, with its low profile, it is comfortable to cast all day long. Keep these tips in mind to maximize the reel's effectiveness. Attach the reel to the correct rod. The right fishing rod is a baitcast rod, which can be identified by the trigger-shaped piece of plastic that hangs below the reel seat. Also, make sure both rod and reel can handle the fishing line you opt to use. Abu Garcia Silver Max baitcasters can hold 160 yards of 12-lb. line. Check the side of the rod just above the handle to make sure it also can handle 12-lb. line. Make sure the rod and reel combination is comfortable when you hold it in your hand, and that it feels well balanced. Make sure the reel's drag is set properly. If it is too tight, you risk having a big fish snap your line. If it is too loose, your ability to set the hook will be compromised. Before you begin fishing, give the line between the reel and the first rod guide a firm, steady tug. The line should come off the reel. If it does not, loosen the drag. If it comes off easily, tighten the drag. To loosen the drag, spin the star-shaped piece on the handle of the reel clockwise. Turn it counterclockwise to loosen the drag. The Abu Garcia Silver Max includes a magnetic resistance system that can reduce the risk of line backlash when tightened, and increase casting distance when loosened. The resistance is controlled by a dial on the side of the reel opposite the handle. A clockwise turn increases resistance and a counterclockwise turn loosens it. 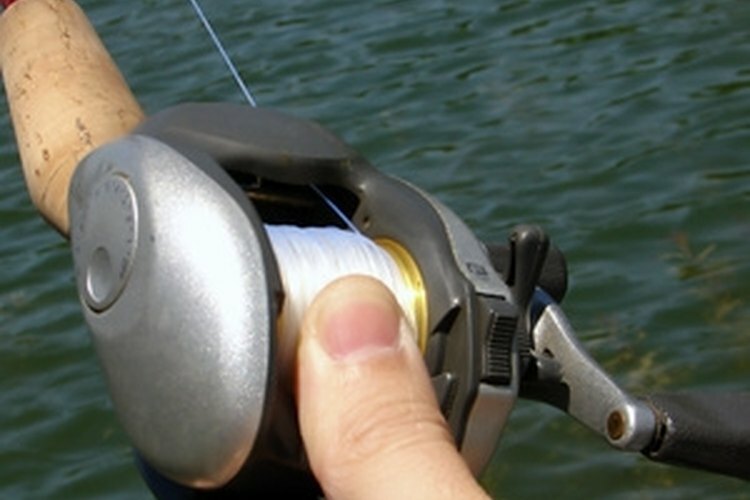 To check the resistance, attach a lure to the end of the fishing line and click the reel's thumb bar. Allow the lure to fall to the ground. The lure should hit the ground without causing the reel to backlash. If it does, increase the resistance. If the lure falls slowly or doesn't make it to the ground, decrease the resistance. As you become more comfortable casting the reel, backing off the resistance will allow you to increase the distance of your casts. While Abe Garcia Silver Max reels can be used to fish a variety of lures, they are especially effective when anglers want to reel their lure back to the boat quickly. That's because the reels have a 6.2:1 gear ratio, which means each revolution of the reel picks up more line than would a reel with a lower gear ratio. As a result, the reel is especially effective for fishing fast-moving lures like spinnerbaits, lipless crankbaits and buzzbaits.